1. To prevent any more panic, the Swine flu is from now on known as The Bacon-Flu, because it sounds much nicer and not so scary. 2. If contaminated with the Bacon-Flu - make sure to draw a pig's nose on your face mask to warn others when out in public. 3. To improve your immune system, add a spoon of cod liver oil to your cornflakes every day. 4. Keep a wickedly gorgeous hairdo, like that of Noel Fielding, to fend off the virus. 5. Listen intently to Untrust Us by Crystal Castles to stimulate your underground electric look and keep in shape. 6. 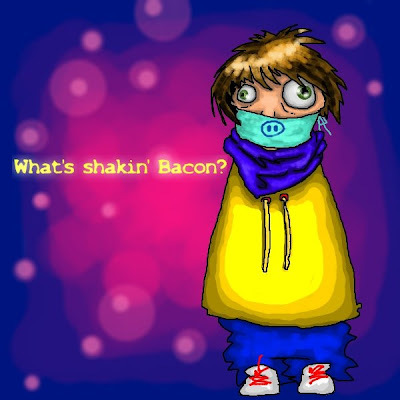 Bacon can be eaten as normal, the subtype H1N1 (Bacon - Flu) does supposedly not transmit through food. This seems to be the topic of the week, most blogs have something on this subject. Apparently it can be avoided if you take the right oink-ment. Early signs of the disease are a really bad rash-er and lots of scratchings. For anyone needing hospital treatment, special 'ham-bulances' have been put in place.